Explore our Creamy Shrimp Pasta recipe tonight. 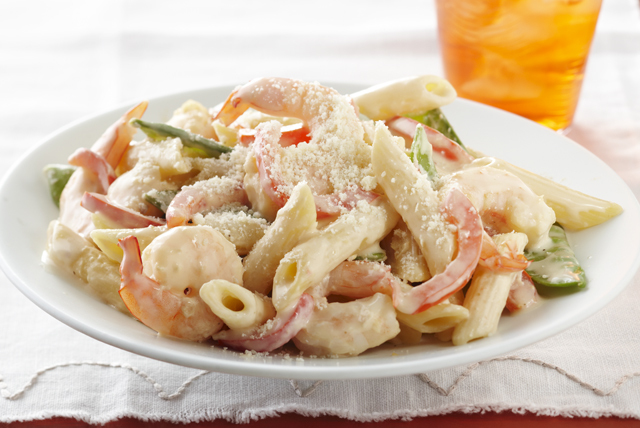 Our Creamy Shrimp Pasta, made with peppers and pea pods, is big on flavor but easy on your waistline. Meanwhile, heat dressing in large skillet on medium heat. Add shrimp and peppers; cook and stir 3 to 4 min. or until shrimp turn pink. Add pea pods; cook and stir 2 min. or until heated through. Add Neufchatel; cook 2 to 3 min. or until Neufchatel is completely melted and mixture is well blended, stirring frequently. Prepare using multi-grain or whole wheat penne pasta.